This is a guest post from Aquarium staffer Laura Dill. Laura works in the Development office and helps to raise money to support Aquarium programs, like the Marine Animal Rescue Program. Last fall, she expanded her mission to help marine animals to include her off-time! (Learn more about those efforts here, here and here.) 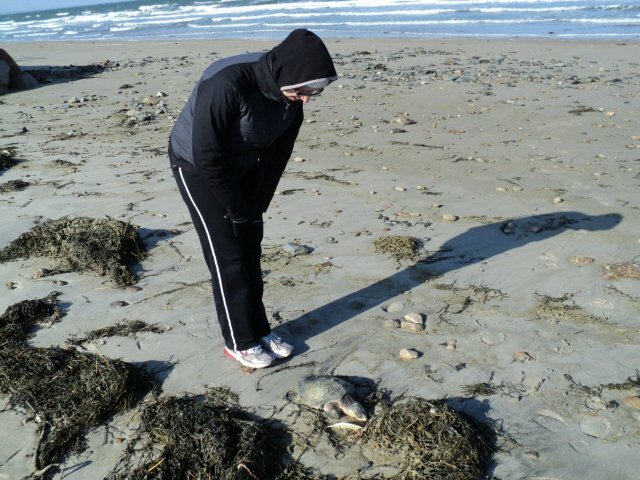 Follow along below as she returns to the beaches of Cape Cod to search for cold-stunned sea turtles. One of my favorite times of the year is when the leaves start falling and the calendar turns to November. Not only to have turkey, stuffing and pumpkin pie but to spend time walking through bitter winds on the beaches of the Cape in search of stranded sea turtles. Laura arrives at Mass. Audubon in Wellfleet. This is where rescued cold-stunned turtles get their intake exams. Last Saturday day morning, I woke up to a warm sunny day in Brewster which is usually a sign that sea turtles will not strand. They need a combo of strong wind and wave current to catapult them on to the beach (like the nor'easter that hit soon after Sandy). The best time to walk the beach is about an hour after high tide so with high tide at 7:40am, I prepared breakfast and afterwards my sister (Elizabeth), brother-in-law (Chris) and I started putting on our rescue sea turtle gear. We never know how the ocean will welcome us to the beach so layers are the best defense. We put on the long underwear, boots, mittens and hats. 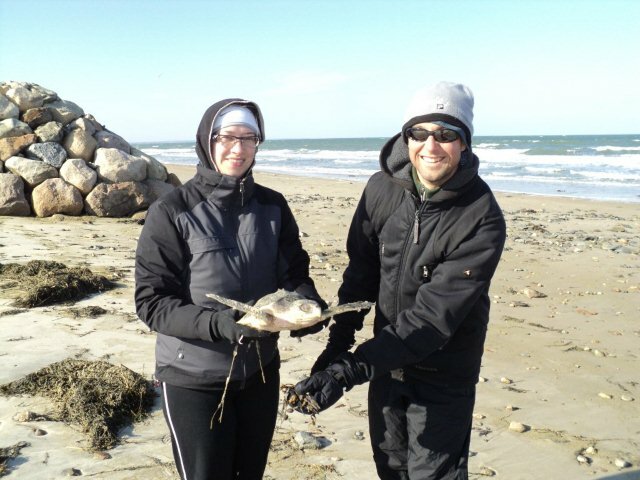 On this occasion we were assigned to a beach in Dennis from Mass Audubon in Wellfleet. It was a very rocky beach and at some points we were scaling rocks so the ocean wouldn’t get our feet too wet and cold. I thought with so many rocks finding a sea turtle could prove to be very difficult but we were determined. 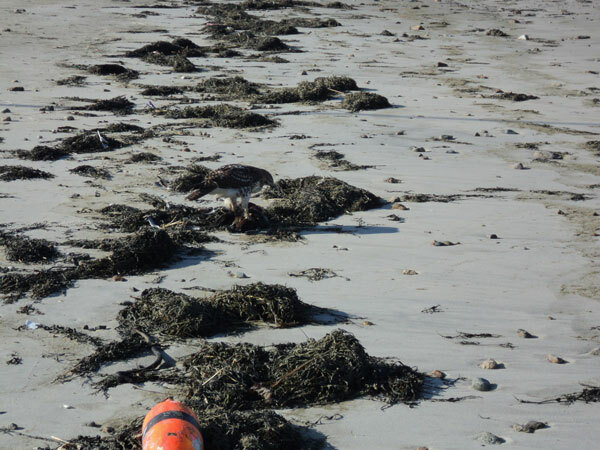 At the very end of our beach was a huge open area where a ton of seaweed and debris washed up. I saw a hawk eating something and ran up to it to see if it might be a turtle. The hawk had no desire to stop munching on his morning snack and luckily the snack was a bird that washed up. 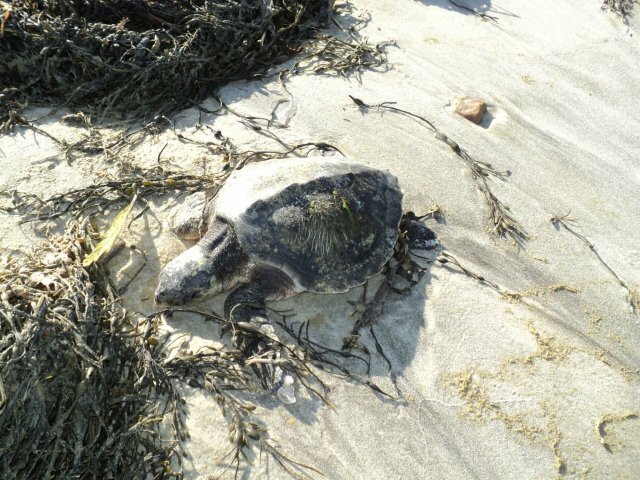 I walked the rest of the area where much of the seaweed washed up and then I saw it, a beautiful sea turtle. Laura's sister, Elizabeth, gives you an idea of how tiny this Kemp's ridley turtle is. The turtle was motionless but looked in perfect shape. The shell was all intact, flippers had no signs of injury and his face had no abrasions. It's so important to find them as soon as possible so predators do not get to them and they are not exposed to cold air for an extended period. We rushed him off the beach and with the sun’s heat the turtle started to show signs of life. His eyes started to open and his flippers started to move. He was swimming in the air while we rescued him off the beach. We then brought him to MassAudubon, careful not to warm him up too quickly as we want their internal body temperature to slowly rise. Every time I walk a beach in search of stranded turtles, I hope that if a turtle stranded that my eyes will find it. It was a very thankful moment for me to find this little Kemp’s ridley among all the rocks and seaweed. Now this lucky sea turtle is recuperating at the New England Aquarium’s sea turtle rescue center in Quincy. 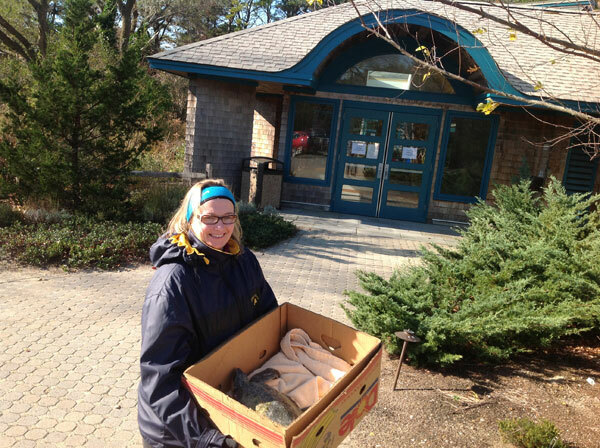 Elizabeth and her husband Chris pick up the turtle to start its rehabilitation journey. Another thing I will be thankful for this Thanksgiving are two organizations that are giving this sea turtle his fight back to survive this crazy world, the New England Aquarium and the Massachusetts Audubon Society! Nice job Laura! Keep up the good work for this critically endangered species.